(Nanowerk Spotlight) The concept of nanodentistry was introduced by Freitas in 2000: "Nanodentistry will make possible the maintenance of comprehensive oral health by employing nanomaterials, biotechnology including tissue engineering, and, ultimately, dental nanorobotics." 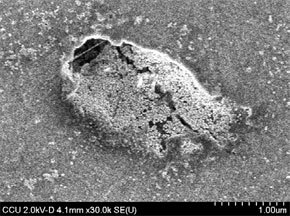 Dental nanorobots are certainly many years off but researcher are making progress already with nanotechnology in dental care applications such as composites, bonding agents, and impression materials as well as nanostructured implant materials. For those of you with hypersensitive teeth, a new nanotechnology treatment proposed by researchers in Taiwan might one day bring pain relief. Dentine hypersensitivity (dentin is the main tissue that forms the shape of the tooth; this material exists between the pulp and the enamel, and is comprised of a series of dentinal tubules stacked on top of each other) leads to pain when fluid movement in dentinal tubules (microscopic canals that run from the outside of the dentin to the nerve inside the tooth) promotes mechanical deformation of nerve endings at the pulp/dentine interface, which is transmitted as a painful sensation. Researchers have found that sensitive teeth have an increased number of dentinal tubules (35.6% compared to 9.3%) and are wider in diameter (0.83 µm compared to 0.43 µm) than the dentinal tubules of non sensitive dentine. The Chinese researchers have demonstrated that this tubules can be blocked with the aid of gold nanoparticles. The world's smallest gold fillings, so to speak. Gold has long been a favorite material for all kinds of dental work – dental prostheses, including inlays, onlays, crowns, bridges, periodontal splints and posts and cores – because it has sufficient strength and corrosion resistance, is relatively biocompatible and is known to have a long lifetime as dental prostheses. An interesting aspect of gold at the nanoscale is that gold nanoparticles exhibit a clear size-dependent trend: the smaller gold nanoparticles get, the lower is their melting point. This deviation of the melting temperature from the bulk value becomes dramatic at a size around 5 nm in diameter, ultimately reaching well under 50% of the bulk melting point of gold. 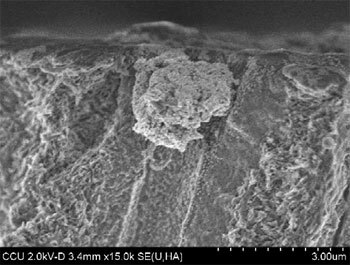 One of the methods of closing sub-micron sized dentinal tubules explored by Dr. Chris Wang and his team involved the sintering of highly concentrated gold nanoparticles that were brushed into the exposed open ends of dentinal tubules. Laser irradiation induced the photofusion of gold nanoparticles via photothermal conversion. Wang says that the fill-in depth of both the nanogold aggregates comprising 30 nm gold nanoparticles and their fused form is crucial for future clinical use. "The cutaway profile of a typical sample revealed that the brush-in depth and then the fused gold chunk after laser irradiation were about 2 µm. This morphology offers further evidence that the photofusion process occurred during the laser irradiation. The laser-induced fusion process indeed seems to be very promising for the purpose of occlusion of dentinal tubules." The researchers in Taiwan say that for clinical use one might need to modify the material and to improve the techniques to obtain a better fill-in depth considering the normal wear rate of both fill-in material and dentine. "The laser-induced sintering process has made this approach very interesting for practical use" says Wang. 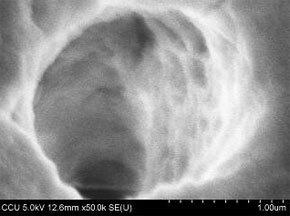 "Much improved metal-to-ceramic binding will be another important issue in future studies."